Innovative new plug-in for Maxon C4D imports mocha data into 3D space for exciting new VFX and motion graphics workflows. 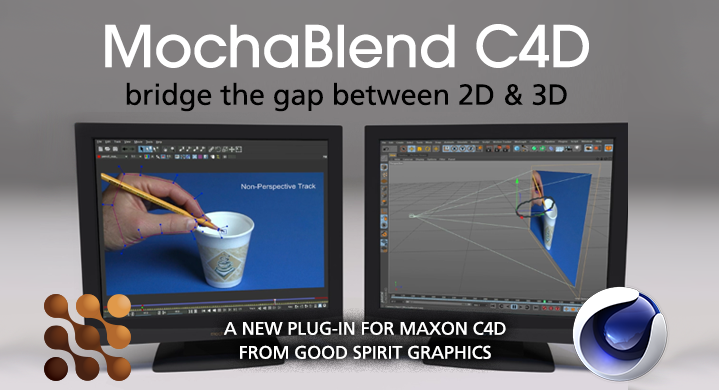 Today, Imagineer is announcing a partnership to release MochaBlend C4D, a new software plug-in developed by Good Spirit Graphics. MochaBlend was designed to bridge the gap between 2D and 3D workflows and gives visual effects and motion graphics artists innovative new ways to marry computer graphics to video footage. MochaBlend C4D is a plug-in that runs inside Maxon Cinema 4D and gives users the ability to import mocha’s 2D planar tracking data and roto-splines into a 3D solved workspace. This exciting new workflow can give amazingly quick results with a unique Single Plane Solver that takes the complexity out of traditional 3D camera tracking and match moving. Watch a quick video of mochaBlend C4D in action! Single Plane Solver: Solve camera & objects, perspective tracks & non-perspective tracks. Roto to Geometry: Convert roto-splines from mocha into animated geometry with depth that can interact with both physics and simulations inside 3D animation programs. MochaBlend C4D imports mocha’s camera-solve data more easily and with more options. AE Exporter: Includes MochaBlend Exporter for Adobe After Effects. Export animated masks from AE to C4D! Beyond the 2D to 3D tracking implementation, MochaBlend C4D also introduces a new workflow to convert 2D roto-splines into 3D geometry with animated camera mapping. This workflow can be used for a variety of creative animation and effects purposes including 3D extrusions, particle simulations, and even 2D to 3D conversions. While the product was in development, David Torno, the Technical Director of Ghost Town Media in Los Angeles took the software for a spin and created a compelling test project. First, David used mocha Pro to rotoscope footage of a woman running on a set. The mocha animated spline data was imported into C4D’s 3D space using MochaBlend and then extruded to drive a particle system. The ability to place 2D roto-splines into a 3D project and interact with C4D elements is a unique time saving solution for animators and technical directors. MochaBlend C4D plug-in is now available for Windows or Mac OS-X for $250 USD. The plug-in can be purchased on its own or included as a special upgrade for After Effects users who wish to upgrade the Adobe Creative Cloud bundled mocha AE to mocha Plus or mocha Pro. Notes: MochaBlend supports C4D versions R14 and above. MochaBlend supports the Adobe bundled mocha AE for 2D track import, but requires either mocha Pro or mocha Plus v 4.1 for mocha’s mask support and 3D Camera Solve support. To purchase or learn more, visit Imagineer Systems. MochaBlend C4D is developed by Good Spirit Graphics. Visit to learn about MochaBlend for Blender community and other products. Imagineer Systems is the Academy Award-winning developer of visual effects solutions for film, video and broadcast post-production markets. Imagineer Systems has made its mark on countless Hollywood blockbuster films including: “Star Wars: Episode VII,” “The Hobbit” and the “Harry Potter” series. Imagineer’s desktop product line consists of mocha Pro™ – roto, planar tracking, compositing, and removal utility; mocha Plus™ – a planar tracking and roto utility designed for After Effects, Premiere and Final Cut Pro users. Imagineer Systems was founded in 2000 and is headquartered in Guildford, United Kingdom. In January 2015, Imagineer Systems was acquired by Boris FX.